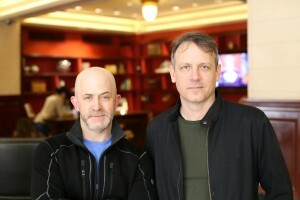 I met with director Brian Knappenberger (We Are Legion: The Story of the Hacktivists), on Monday, March 13, 2017, at SXSW, to discuss his latest hard-hitting investigative documentary, Nobody Speak: Trials of the Free Press (which I also reviewed), which got picked up by Netflix after its premiere at the Sundance Film Festival. The movie is an important exposé of the troubling trends of our day, where the rich and powerful feel it their due to curb the influence of the Fourth Estate. Knappenberger takes, as his departure point, the 2016 lawsuit brought by wrestler Hulk Hogan against Gawker Media, which effectively bankrupted the company, but quickly moves beyond that story to discuss its ramifications for a free press. Here is a condensed digest of our conversation, edited for clarity. Hammer to Nail: Brian, this is such an essential film for our time – this very moment – perhaps the essential film of our time. How did you get started on it, and did you have any sense that its topic would become any more urgent as you went along? Granted…(laughs)…I ask that question fully aware that the lawyer Floyd Abrams says, in the movie, that this is “one of the most important first-amendment cases of all time.” But still, did you have a sense of just how relevant it was going to become as you went along. Brian Knappenberger: Not really. I mean, I knew it was relevant and I knew it was important. And I had a sense…you know, sometimes, as a filmmaker, you have this sense of undertow, where something big is happening, and it may not be really easy to articulate that, right off the bat, when you start, but you understand that big things are afoot. And I could tell that with the Hulk Hogan case, even before it was getting a lot of attention. I mean, it always got some attention, because of Hulk Hogan. But the privacy vs. first-amendment issues seemed so critical, so interesting to me, that I thought I really wanted to jump into it. I could see right away that this trial wasn’t happening in isolation, right? There was a backdrop of this chaotic political campaign that seemed to be resonating in interesting ways with sort of the same dynamics that were going on with the trial, and then, in the Las Vegas Review-Journal story, I saw some similar themes, so we jumped in. Of course, that was before it was revealed that [Silicon Valley entrepreneur] Peter Thiel was behind the Hulk Hogan case, and before Peter Thiel became a serious supporter of Trump, and eventually became part of Trump’s transition team. So, it started out feeling like important issues were at stake, but as the year progressed, and the Trump campaign and the chaotic election all ramped up, it got much more so, in a way that is genuinely frightening. HtN: Yes. It is frightening. I am scared, already, just reliving your movie. HtN: (laughs) So, did you have any issues with access? I mean, we don’t have Hulk Hogan; we don’t have Peter Thiel; we don’t have [Hogan’s friend, at center of trail] Bubba the Love Sponge; none of them are interviewed directly. I don’t know if you tried – you can tell me – but you do have, on the other hand, David Houston Hogan’s lawyer, so he was willing to do it. But even he may have been afraid that he might come off looking like a jerk. He’s great, though. I’m glad he’s in the film. BK: Oh, I think he’s actually really great! As for Hulk Hogan, I’m pretty sure that he wanted to do it – I don’t know 100% – but they were locked in such a bitter, brutal battle behind the scenes that I think they were afraid that, though on one hand they wanted to tell the story, on the other hand, they realized that any word out of place could negatively affect what they were trying to accomplish. So I think Hulk Hogan was a little cautious in that regard. HtN: So you think he was advised by his lawyer to not do it? BK: Maybe. And I think maybe his decision, too. If we would have been creating the film now, after the trial, maybe he would have done it. Peter Thiel, I don’t know. We asked him a bunch of times. I wanted him to be in the film. I definitely would have put him in the film. He’s chosen not to talk that much about his efforts behind the scenes, on the Gawker case. He did confirm it to The New York Times, and then he did talk about it, briefly, at the National Press Club, in Washington, DC. That’s our original footage. We got that. That’s as close as we got. HtN: And he let you do that? What kind of permission did you need to get in there? BK: Well, you just have to be OK to get into the National Press Club. So it wasn’t crazy tricky to get in there. HtN: And in that situation, do you need him to sign a release? BK: Oh, no, not at all. He’s appearing in front of the Press Club. Presumably, he’s saying stuff that reporters can write about. It was a little odd, though, in that they made everybody write down questions on cards, and then they collected the cards and didn’t give them to the moderator. (laughs) So, I had actually asked a question on their website. I had noticed, on their website, they said, “Submit questions for Peter Thiel,” and I had submitted 6 questions for him. And the one about Gawker turned out to be the one that they used, and so that’s the footage we used in the film. HtN: Excellent! And then the Gawker folks, they were willing to tell their story? Did you have any issues convincing them? Any of them not want to do the movie? BK: Well, Nick [Denton, Gawker founder and owner] was pretty forthcoming. We talked to him at a very rough period of time for him, kind of right in the middle of his realizing the gravity of what had just happened to his company and to his own personal life. I find A.J.’s story very compelling – A.J. Daulario, who was the original writer and poster of the article that caused so much trouble. HtN: And he was the editor, as well? BK: Yes, he was the editor-in-chief. And so, I found his story very compelling, and I’m very happy he’s in the film. You know, some of the other Gawker writers, like John Cook, are great. And he also was sued. BK: Yeah, Charles Harder…(laughs)…he can’t even say! Cook mentions some very nasty letters, and…so he felt like he couldn’t even talk about, in the film, what he wasn’t supposed to talk about. Which shows you how chilling this stuff can be, sometimes. And I wanted to get the Gawker general counsel, who was always very enthusiastic and then mysteriously was unable to do it, during the sale to Univision. So I have some feeling there’s some pressure there to not talk to me. HtN: So Gawker was sold to Univision? HtN: Does that take care of their bankruptcy issue? Is Nick Denton now not in danger of personal bankruptcy? BK: Yeah. Nick Denton actually…there was a quiet article that didn’t get much attention…withdrew from his bankruptcy proceedings about two weeks ago. He was right on the verge of personal bankruptcy for a while. Gawker, of course, was forced into immediate bankruptcy, because they couldn’t pay the $15 million that was a prerequisite…they had to put up the money. And that caused the sale to Univision, and all of that. But Nick Denton was right on the verge for a while, but after the sale to Univision, when that money came through, I think he narrowly averted it. HtN: So is Gawker going to be back up and running? BK: Gawker has continued to run. The flagship site was killed. So there is no more gawker.com. You can go on there and see the last post. I think it’s Nick Denton’s last post. But all the rest of the properties were sold to Univision and are, I think, money-making properties for them. It’s things like Jalopnik, Gizmodo and Jezebel. HtN: Yeah, Gizmodo definitely shows up in my feed a lot. I didn’t realize they also owned Jezebel. BK: Yeah, Gizmodo is probably their biggest money-maker. HtN: Could you give an example of threads that didn’t make it into the story. BK: So many! It really felt…I think the answer to your question is that that always happens, in every film, certainly in every documentary that I’ve ever done, but never quite to this extent. I mean, it was painful getting rid of some of the stories. It just seemed like at every turn, it just got weirder and weirder, and there were so many little side tangents that didn’t relate to the theme we were on, but were still really entertaining. HtN: But you do jump from the Gawker case to the Las Vegas Review-Journal as another example. Were there any other cases like that where you might have wanted to put it in there, just to beef up your case? Other sales? Other muzzlings of the press? BK: Yes, actually. I initially thought I would put the Mother Jones case in. Mother Jones was sued by an Idaho billionaire named Frank VanderSloot, and that was an existential threat for them, as well. They, in the end, won their case against him, and were able to get the legal fees that they needed from readers. Their audience really stepped up and a lot of people donated money for their legal fees. But it was a very, very serious story, and we might explore that in a short film. Ultimately, The Wall Street Journal – which, by the way, is owned by Rupert Murdoch – backed their reporter in a way that I think is commendable and they won that. You know, part of the point of the film, though, is to say that billionaires have such outside influence and leverage over these vulnerable news organizations, and lawsuits are such small change for them, that it doesn’t matter if they win or lose, really. This is a drain on an already vulnerable industry. BK: (laughs)…that they probably wouldn’t for Gawker. I think that’s true. You know, people have often said, when they see the film, “Well, we get the Las Vegas Review-Journal story, those people are reporters, they’re clearly heroes, an example of people clearly speaking truth to power and all that, but why did you do the Gawker story?” And I say, “Well, if you believe in free speech or you don’t. You believe in free speech for those you disagree with or you just don’t believe in at all.” And I don’t think I would have been as compelled by the Gawker story if they weren’t a little complicated. HtN: Right! And that’s good, and it’s what makes this a good film. So, I’m curious: the case against Gawker seems so problematic, and Floyd Abrams makes that statement about the first amendment, and the judge seems so problematic…maybe I missed this in the movie, but why didn’t they appeal? They said they were going to. What happened with that? BK: I think they just ran out of time. I think that’s what it is. They were forced to put up $15 million almost immediately, and I don’t 100% understand that. That might be a quirk of Florida law, or something, but they didn’t have that $15 million. So they were immediately forced into bankruptcy, so the pressure was on, right from the beginning, In the end, after they were forced to sell, I think they were just weighing the long-term costs and drag on everybody’s life that this long, drawn-out appeal would have been, against just putting it all behind them. And I think that’s what they chose. HtN: Have you been, or do you have any worries that you will be, threatened for libel or slander for this movie by any of the forces portrayed therein? BK: Yes and no. Yes, in the sense that you don’t make a movie about thin-skinned, highly litigious billionaires who can’t stand a word of criticism without understanding that, even if you get it all right, they still may sue you. That’s kind of the premise of the film, and if they did, of course, that would prove my premise in a way that would probably be uncomfortable for me. But, no in the sense that, you know, I’ve been doing this a while. We’ve fact-checked very carefully. We may be critical at times – and we certainly have a point of view – but I think we’re fair to all sides. I have sympathy, for instance, to Hogan’s side of this. You know, I think we’re pretty buttoned-up. We’re not taking any cheap shots. HtN: Unless one thinks that all criticism is a cheap shot. HtN: Because you have that whole montage at the end, which leads directly to today and to Trump. HtN: You do! You make a very strong case that we’re in ever-greater danger now because of who is President. HtN: And I support that! Let’s certainly hope that your film is viewed by as many people as possible and that everyone takes it for what it should be. BK: Thank you! You know, Trump is both a thin-skinned, highly litigious billionaire and the head of the executive branch of the United States government. If you look at the way he has behaved, whether as candidate Trump, President-elect Trump and now, as President, I think there is genuine reason to be concerned when you look at the kinds of powers that he has now. I mean, think about it: he has control of a mass surveillance state, which has already been used, under Obama, against journalists. And with plenty of other dictators, that’s one of the first things they do, right? They use the surveillance state. And he has control of the FBI. With the tools that he now has under his control, and the way that he has presented himself up until this point, I think that we should be genuinely, genuinely frightened that this person is now in charge of protecting the Constitution. HtN: I’m smiling, not because I don’t agree with you, but because, if you believe recent stories put out by the White House, he doesn’t have control, because there’s a “deep state” within the government, within these agencies, working against him. He would have you believe that “No, no, no!” But there you go. BK: But we have a bizarre situation, in which an entire administration is just infested with untruth, and lies, and propaganda, and are just outraged when anyone points out those lies. So, we have someone who is genuinely, I think, at odds with the Constitution of the United States. I mean, it’s pretty clear, in the first amendment: free press is important to a democracy; free speech is important to a democracy. HtN: You quote Thomas Jefferson saying that, at the end. HtN: So, moving away from politics and ideology, with what size crew did you work and what kinds of rigs were you using to film? BK: We used a variety of different crews. Sometimes we had…based on whatever budget we had at the time (laughs), because we moved very quickly, and were sometimes very low-budget…so sometimes it was just me and a camera, while other times we had a three- or four-person crew. I like to work with a cameraperson and a sound person, and maybe an extra producer, as a small field crew. We shot with multiple cameras…all 4K…Sony FS7s. HtN: So you shot all in 4K? BK: Yeah, right from the beginning, which is good, because that’s what Netflix…that’s how… they present the film that way. And we got picked up by Netflix. HtN: Well, congratulations! I loved the film.